Have you ever walked into a bar full of people yelling and screeching at the top of their lungs? Well, maybe fun, depending on your mood. And the place. The night before I walked into the suburban New Jersey version of Chickie’s and Pete’s, I’d gotten exactly 4 hours of sleep. My alarm went off at 3:30am that morning, followed by a ride to the airport, a proper TSA fondling, planes, elevated tram rides, New York City subways, and hundreds of turnpike miles driving a dirty rental car. 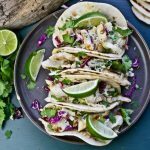 By the time I pulled into my Comfort Inn in the not beautiful Bordentown, New Jersey, I was ready to get out of the suit I’d been wearing for 18 hours, down a packet of Goody’s Headache Powder, and find something to eat for the first time in almost 36 hours. But in a show of typical Jersey hospitality, my room’s air conditioning was broken, and that was just not going to work for me on this 90 degree summer night. So at an hour that I had hoped to already be halfway through my first beer, I had to set out to find another place to stay. Fortunately, the Best Western was more than happy to give me a room with working air conditioning in exchange for a hundred bucks. Even more fortunately, I spotted Chickie’s and Pete’s on the way there. I noted the bright neon lights and the full parking lot. At 11:30pm on a Wednesday night, something still open was all I was looking for. My pounding headache was just beginning to subside when I opened the front door and was blasted with the sounds of screeching. Tonight, I just wanted a cold beer and some food. 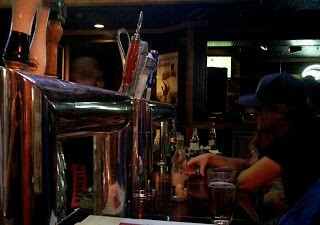 Fortunately, I found a spot at the bar with a flat screen showing one of the west coast baseball games. Perfect. Except for all that screeching. I asked the barkeep for a Sierra Nevada Pale Ale on draft and a menu. 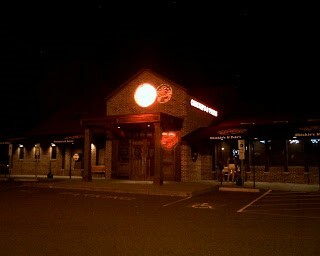 That’s when I discovered that this place is a somewhat famous small chain of Philadelphia crab houses/sports bars. 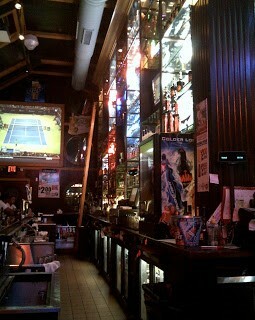 In fact, the joint’s been voted one of the best sports bars in America. How lucky is that? I mean, you gotta love a place whose motto is, “It’s a lot more fun to eat in a bar than drink in a restaurant.” Hey, come to think of it, that might be my new motto! 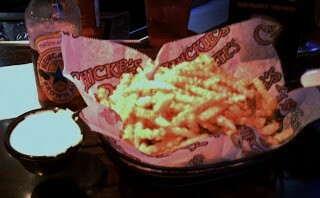 The most prominent item on the menu was “Chickie’s and Pete’s world famous crab fries”. Is there any question? Gotta go with those. How could I live with myself if I didn’t? For about $8 bucks, I got an overflowing basket of crinkle-cut fries covered in Old Bay. They were okay, but what made them world famous was the side of queso attached on both ends of the basket for dipping. Clearly, this item is not meant to be consumed by just one human. I also ordered their crab cake sandwich. 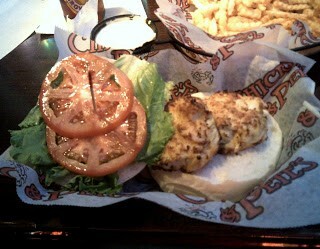 The sandwich was tasty with two small crab cakes, lettuce, tomato and remoulade sauce. Now, Chickie’s and Pete’s crab cakes aren’t going to make me forget about the ones served right off the shore of the Chesapeake Bay, that’s for sure. But, seasoned well and with a good bit of bready filler, these crab cakes will do if you can’t get to Baltimore or Norfolk anytime soon. At nearly midnight on a Wednesday, I really had nothing to complain about. 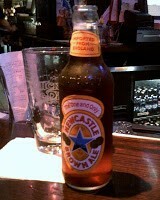 Especially when I noticed that Newcastle and Miller High Life bottles were on special. Forget the $4.75 Sierra Nevada on draft, I’ll never pass up a deal on beer. Unfortunately, the $3 Newcastle (which I haven’t had in years) reinforced all my pre-conceived notions about the British who brew this bland, boring, waste of good barley. After choking it down, a Miller High Life—the “Champagne of Beer”—never tasted so good. Especially for $2 bucks. Just as I took my last swig, the table of American Idol wannabees behind me ordered up yet another round of kamikaze shots. It was going on 1am. If I wasn’t so tired I might have noticed (or cared) that some of them were somewhat pretty enough – at least for Yankee chicks. What is it about Jersey girls anyway? They’re so loud and so coarse. All I know is that after an hour of having to listen to them, I was in desperate need of another Goody’s. And a good night’s sleep. Can Something Called A Juicy Lucy Really Help You Survive A Minnesota Winter?